Scenic landscape view of the beautiful colorful small mountain town of Silverton Colorado north of Durango. Silverton Colorado is a National Historic Landmark. Visiting Silverton is like take a step back in time. 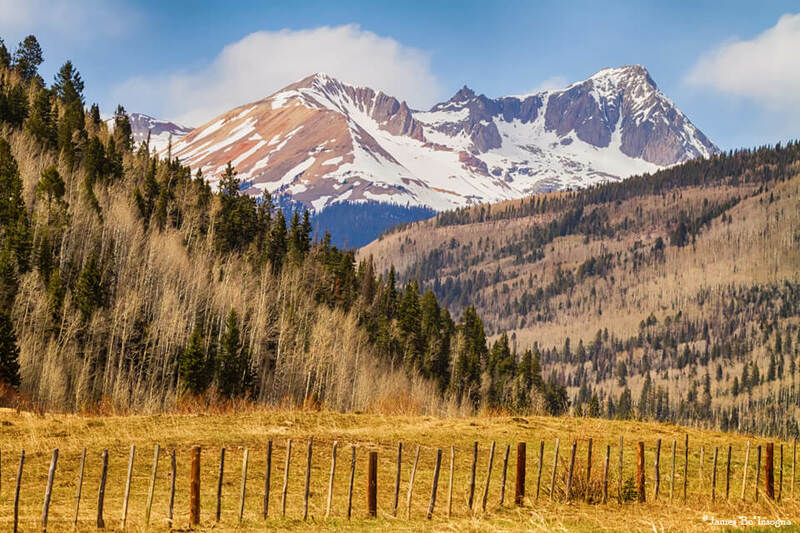 Silverton is linked to Durango by the Durango and Silverton Narrow Gauge Railroad, a National Historic Landmark. 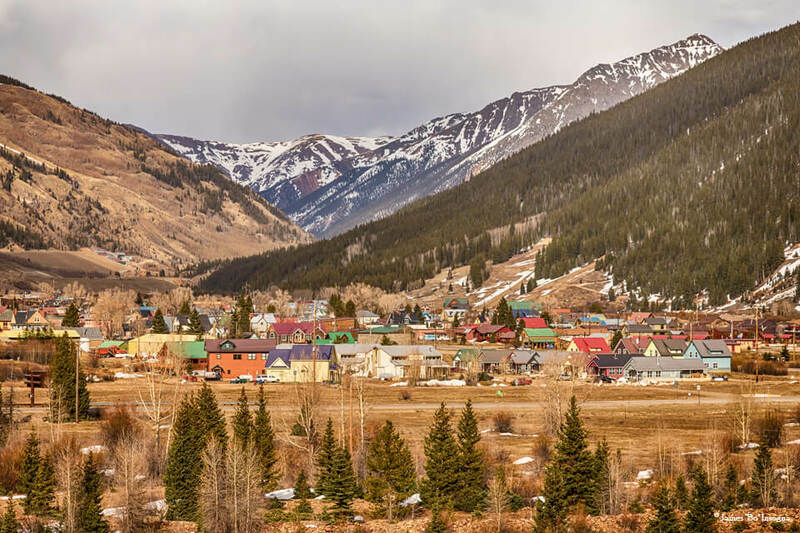 Silverton no longer has active mining, but subsists by tourism, maintenance of US 550 (which links Montrose with Durango via Silverton), mine pollution remediation, and retirees. In 2002 an extreme ski mountain, Silverton Mountain, opened near the town. A few of My Favorite Irish Toast. 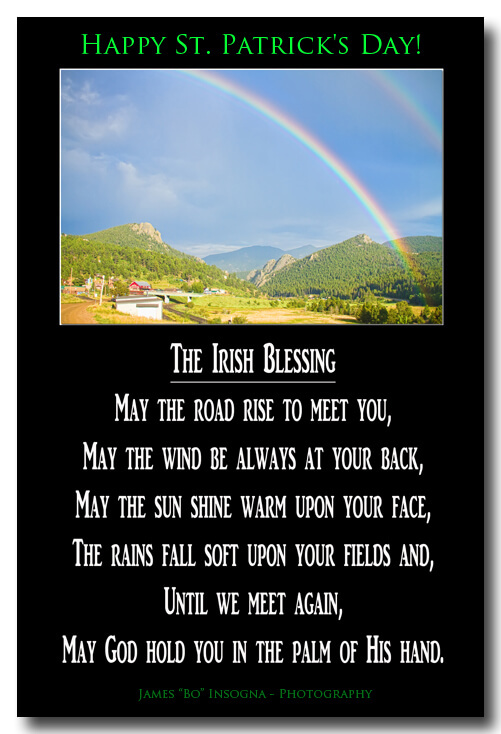 May the luck of the Irish, Lead to happiest heights, And the highway you travel, Be lined with green lights. My friends are the best friends, Loyal, willing and able. Now let�s get to drinking! All glasses off the table! Here�s to you and yours, And to mine and ours, And if mine and ours ever come, Across you and yours, I hope you and yours will do, As much for mine and ours, As mine and ours have done, For you and yours! My what big ears you have.... 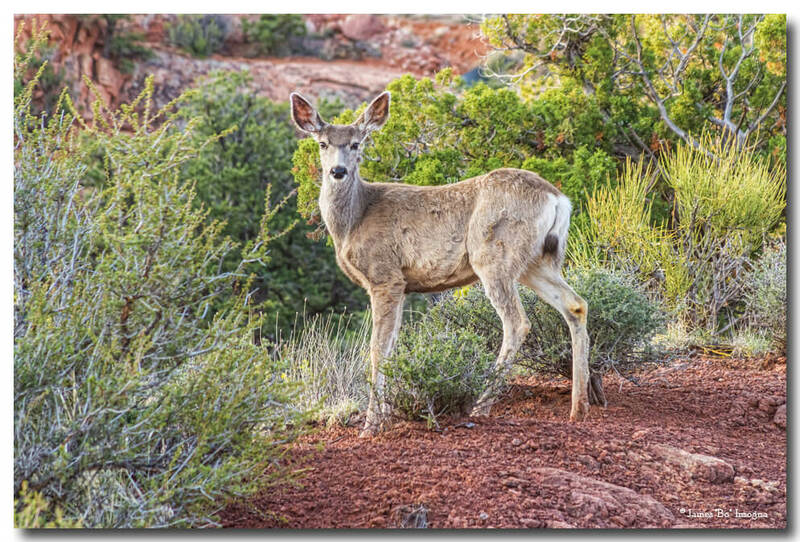 It was fun running into this deer in the wilderness of Canyonlands Utah, as we both did our stare down. Such a cute animal to see. Deer are found all over the world, with the exception of Australia and Antarctica. Deer often seek out protein found in various types of weeds, alfalfa and clover and even soybean plants. Mule deer can move long distances during spring and fall migrations to avoid mountain snow. Besides humans, the three leading predators of mule deer are coyotes, gray wolves, and cougars. The most noticeable differences between white-tailed and mule deer are the size of their ears, the color of their tails, and the configuration of their antlers. This Colorado nature landscape fine art wildlife photography image is available as custom framed or unframed poster prints, decorative canvas gallery wrap or museum wrap, awesome clean acrylic art prints, durable water resistant lightweight metal fine art prints, home decor products, shower curtains, throw pillows, lifestyle products and licensing for all kinds of media. Winter Season view of St Malo's Chapel on the Rock, officially, Saint Catherine of Siena Chapel. Built atop a massive granite rock, it's in every way a part of the valley landscape. 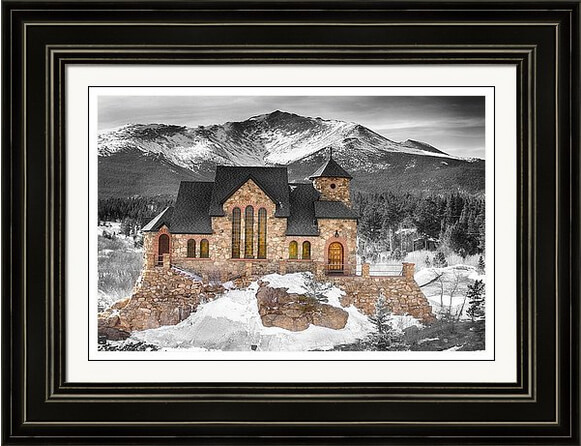 Saint Catherine's Stone Chapel on the Rock sits in the shadow of Mount Meeker, the 13,916-foot peak in Rocky Mountain National Park. The Chapel is a popular tourist landmark in Allenspark, Colorado, visited by thousands every year. 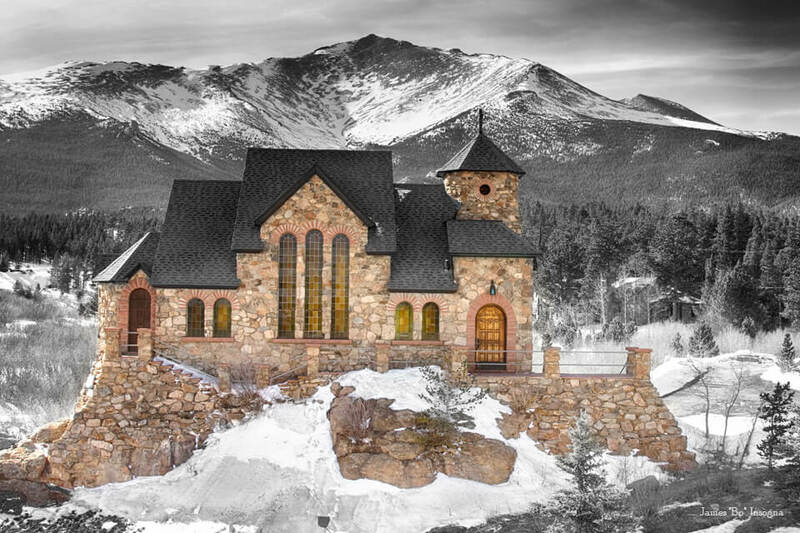 The chapel is located on the grounds of the Saint Malo Retreat Center, the retreat center for the Roman Catholic Archdiocese of Denver, near Mount Meeker. In 1999, Boulder County designated the chapel as a historic site. Pope John Paul II prayed at the chapel during his visit to Denver for World Youth Day in 1993. This Colorado nature landscape black and white with selective coloring fine art photography image is available as custom framed or unframed poster prints, decorative canvas gallery wrap or museum wrap, awesome clean ready to hang acrylic art prints, durable water resistant lightweight metal fine art prints, home decor products, shower curtains, throw pillows, lifestyle products and licensing for all kinds of media. Extreme Weather Images That Come To Life. Colorado Lightning thunderstorm mix. Music: Ethan Meixsell. Day in the life of a lightning storm catcher. Thanks for Watching. Hope you enjoy. A five minute STRESS reliever mind candy for your eyes, brain and soul. This is a very relaxing video mix of spectacular Colorado nature landscapes from the fine art photography iGallery of Bo Insogna music by Beethoven. Hope you enjoy. Fine Art Photography Video Short. High Elevation Forest Sunset Time Lapse Timed Stack. Music by Jingle Punks.